When people design businesses and products, they often get so caught up in the details of the creation that they forget that businesses do not last forever. When designing any type of business or product, you need to think through the whole life cycle of the design. That life cycle should include an end game. For this reason, I am intrigued with the web site by the Business Enterprise Institute called Exit Planning. This service is designed to help individuals create exit strategies. Exit strategies might involve grooming a successor or selling the business for top dollar. 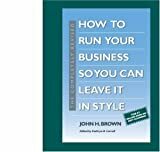 The organization offers seminars, exit strategy reviews and a book titled How to Plan your Business So You Can Leave It in Style by John H. Brown.